Magic is hard. There’s so much magic in fantasy that sometimes it’s used to define fantasy (although that’s an oversimplification) but the fact remains – Magic is hard. There are many books where the magic just doesn’t hang together, or where the reader is bogged down in the minutiae of the cleverly-worked-out magic system that the author is so proud of, or where the magic is a copy’n’paste wands and spells afterthought that doesn’t add much to the story at all. So when you come across a book like The Nowhere Emporium by Ross MacKenzie that does magic right, it’s a real pleasure. This launches Daniel on an adventure in the magical world of The Nowhere Emporium, a shop that travels in time and space to offer wonders to people across the globe and across the centuries. The owner, Mr Silver, offers Daniel the chance to learn the magical ways of the Book of Wonders that guides the magic of the shop. How could he resist? But not everything is as rosy as it appears. Why can’t Mr Silver’s daughter Ellie leave the shop? And who is the strange Mr Vindictus Sharpe, and what does he want with Mr Silver? Intertwined with Daniel’s story are flashbacks to the early days of Mr Silver and Mr Sharpe in 1800s Edinburgh, and these provide a real sense of depth to the magical world. The magic is at the heart of the story. It’s magic that drives Daniel, and Mr Silver, and Mr Sharpe, although they all have different ideas about its use. 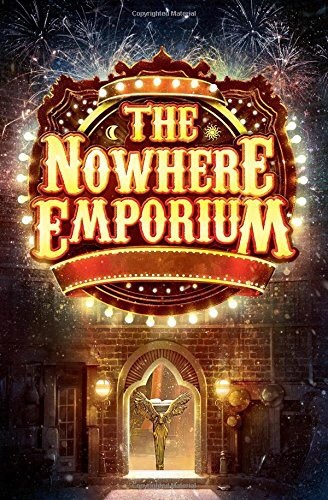 There’s a definite hint of Diana Wynne Jones about the magic – the Nowhere Emporium itself seems to owe a debt to Howl’s Moving Castle, and there’s an air of Chrestomanci about Mr Silver. Given that no-one has ever written about magic better than Diana Wynne Jones, this is a very good thing. The story has a terrific pace, and the climax is suitably thrilling and life-changing while still leaving the story open for a sequel. All in all, The Nowhere Emporium is a truly magical book. Sounds wonderful. Thank you for sharing the review. I think my sons and I will really enjoy reading this.